When you’re on holiday, out on the open road, stopping to refuel your caravan constantly can be a real drag. We are all aware that the speed we drive at and the shape of the caravan, can greatly affect fuel consumption. For example, the less streamlined it looks, the more resistance it offers the wind and the more power you need to move it. There are however, other factors that are less obvious that can help shave off the drag on a caravan, which directly affects fuel consumption. 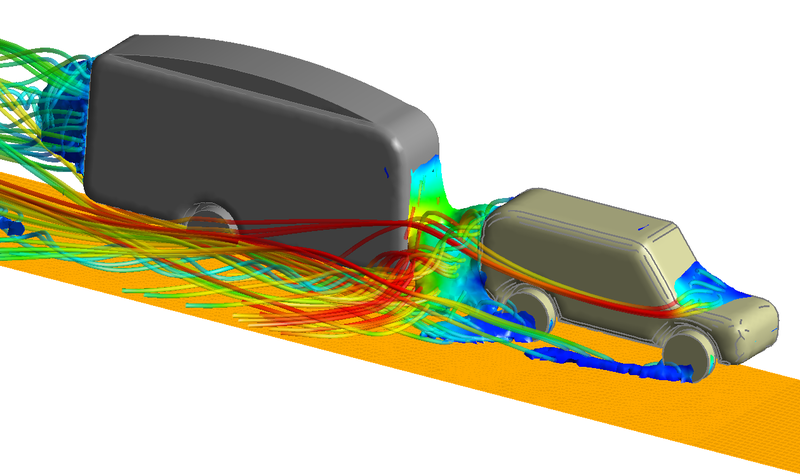 In partnership with Caravan World magazine, we've taken a closer look into the performance of caravans with the aid of CFD. For the purposes of this study, we took a generic shape of a caravan and a lead vehicle. Both were placed in our virtual wind tunnel. The precise shape of either vehicle isn’t that important, as we are seeking to understand trends and the behavioural pattern of drag force, as opposed to definitive numbers. Next, we chose 5 parameters to investigate, namely (i) the front windshield angle of the caravan, (ii) radius of curvature of a fairing sitting on top of the caravan, (iii) relative height of the caravan to the lead vehicle, (iv) distance between the two vehicles and (v) speed of the two vehicles. Special care was taken to choose parameters that are based on caravan design and its surroundings. From an aerodynamics (drag/fuel-consumption) perspective, the performance of a caravan depends a great deal on what is in front of it. The interaction between the two vehicles can be studied if we keep the lead vehicle design constant and only change the relative height of the caravan and its distance to the lead vehicle. Put another way, the aerodynamics of an object depends not just on itself, but also what is around it. Having different vehicle heights and/or a non-optimal space will cause the air to get trapped between the two vehicles as shown in the image to the left. Interestingly, the same turbulent air that lies behind the caravan, (which creates less than optimal conditions for those following on the road), is also present just behind the lead vehicle. From an aerodynamics perspective, we want to keep the flow smooth and ‘continuous’ between the lead vehicle and the caravan. (The presence of turbulent air between two objects is major cause for concern with aerodynamicists. This is the very reason so much effort and research is put into a cyclist’s posture, and position when following the leader in a peloton. Or the distance maintained between two aircraft on landings and take-off). Given all the parameters that could affect the drag (and therefore fuel consumption), the burning question now becomes which factor is the most dominant and by how much? Is the caravan doomed with a high fuel consumption based on its inherent design (height and windshield angle) or is it dependent on the user (i.e. the speed at which it is driven, distance between the vehicles, addition of a fairing on the caravan)? We ran 100’s of combinations using different designs, speeds and configurations. Based on the results below, the news isn’t so good for those with a lead foot. It is worth pointing out here that using CFD, these (188) trials on different designs, were all achieved over a span of 68 hours. Trying to achieve the same with physical testing by building prototypes for each variation would obviously take much longer and cost significantly more! The most dominant factor that contributes to drag and fuel consumption on a caravan is the speed at which it is driven. This follows from basic aerodynamics theory which states that the drag goes up four-fold, for a two-fold increase in speed. Put another way, the drag you experience at 30kmph is a quarter of the drag that hits you at 60kmph. So unfortunately, speed will eat into your fuel economy and holiday budget. In second and (distant) third place are the relative heights of the two vehicles and the towing distance. Looking at the air velocities (left) from two experiments where only the relative height and towing distance are changed, the effects of these parameters becomes obvious. The image at the top is a taller caravan being towed at a large distance away from the lead vehicle. We can identify the swirling air along the side of the caravan. Also present is a fair bit of swirl at the back of the caravan. Compare that to a shorter caravan, pulled closer to the lead vehicle. The air tends to hug both vehicles more tightly and even at the back of the caravan, the air just drops down to the ground, without creating a large turbulent wake behind it. The faster the air exits the region between, around and past the two vehicles, the less likely you have to carry it along for the ride; the less you ‘take’ with you, the better your fuel consumption. The experiments show that there is some hope for those who seem to be in a perpetual rush: slight tweaks to your towing configuration could drop off some of the drag that your lead foot put on. In the case of the two experiments, both operating at a drive speed of 95kmph, using a shorter towing distance and caravan reduced the drag by forty-eight percent! Needless to say, that is a massive saving and a lot more beer money at the camp! This study was just a first look into some of the parameters that might affect fuel consumption and caravan performance. A more thorough study could include angle of inclination to the road, ground interaction with different chassis heights or even size of the wheel arch. The image below shows all regions where drag might be an issue and how the air ‘flows’ from these regions to interact and affect other surfaces and the surroundings. Tweaks to these might make all the difference to fuel economy. ‘’As my professor in university used to say, drag is a beast and it needs to be respected. But it can definitely be tamed,’’ acknowledges Joel Thakker, LEAP Australia.